We are identified as one of the most celebrated Organic Spices Manufacturers from India. The Cooking Spices offered by us are sourced from the reliable vendors to ensure unmatched quality and tempting aroma. Customers from every nook n and corner of the international market are placing bulk orders for the Indian Cooking Spices due to the inexplicable flavoring property. Customers are also eased with the availability of the Powdered and Whole Spices to meet the requirements. 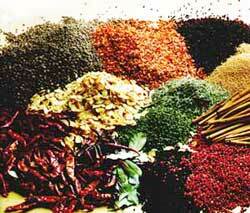 We also provide Whole Cooking Spices at the most reasonable prices.